What’s Best for Pets? Tile or Stone Flooring? It doesn’t matter if you’re buying or remodeling a home, the flooring you choose can greatly impact you as a pet owner. For most owners, pets are part of the family. For this reason, they should be remembered when considering what type of flooring to get. Pets can often be tough on certain flooring surfaces. It’s critical that homeowners decide on a flooring option that is appropriate for pets. Carpet tends to be an affordable option. 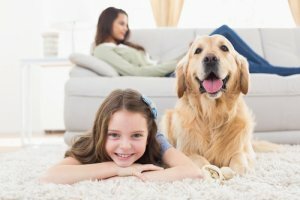 However, many people hesitate to choose carpet because it wears quickly and easily absorbs stains and odors. Likewise, hardwood floors can be scratched and stained quickly. Additionally, they absorb moisture which makes this an impractical choice as well. For these reasons, the majority of homeowners choose stone or tile flooring as the best option. This is an excellent choice for pet owners! Stone flooring is good at resisting scratches. Even if your stone floors get scratched, it’s very hard to notice unless you stare. Additionally, this type of flooring doesn’t absorb moisture making pet accidents an easy clean-up! It also won’t absorb odors so your home stays smelling fresh! Since granite is the hardest of natural stones, it is most likely the best choice. Although, softer stones like marble, travertine, and slate can still be solid options. They just require a little more maintenance. Much like stone flooring, tile offers a lot of similar benefits! These include scratch resistance, durability, and odor plus moisture control. The major downside to stone and tile is the fact that they are hard and cold. Consequently, your pet may find it an undesirable place to lie down. To fix this, use a throw rug or pet bed to make your friend happy! Don’t worry about making the right choice between stone and tile flooring. Both options offer terrific benefits for you and your pets. Both are very durable and create a great look in your home. The biggest difference in this decision is price and personal taste. Regardless of your choice, it’s recommended by experts that you have them professionally cleaned every 12-18 months.